This Moroccan roasted vegetable pilaf with chickpeas is rich in warm flavors and some of the season’s best roasted root vegetables – it makes for a great ethnically inspired meal. Yesterday the distance I ran on my long run was approximately the same/possibly more than the “feels like” temperature outside. And I refuse to accept it. Complacency is not my biggest virtue. So, we have only one option, as I see it. In the markets of Marrakech we can find all the warm flavors that we’ve developed a physical dependency on (some might call it an addiction, but I don’t like to get all medical up in here) tossed up into one fabulous spice mix and mixed into stews/pilafs/big-pans-of-roasted-veggies-galore, with none of the weather we can’t live with and all of the 70F and blue skies we can’t live without. It’s really a win/win as far as the eye can see. Hmm, what’s that? No passport, you say! So we’ll have to travel by Culinary Express. Whereby we don’t leave our kitchens, but cook as though we’re 3,687 miles away. Give or take. 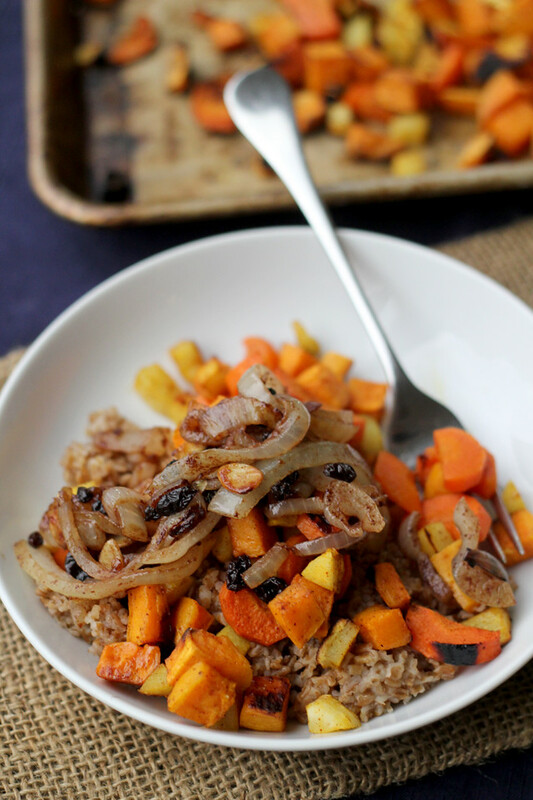 Also a win/win, especially where this Moroccan Roasted Vegetable Pilaf is involved. In it, all of our favorite root veggies are tossed with ras el hanout, a Moroccan spice blend that makes me feel all warm and fuzzy inside, and then roasted to sweet caramelized perfection. They are then served on a bulgur chickpea pilaf and topped with a sweet caramelized onion honey almond relish. So let’s crank up the heat, hope that our bones will someday not feel like they’re frozen all the way through, and dig into a big bowl of this healthy veggie pilaf, letting it whisk us away to the memory of warmer temps and bluer skies. This Moroccan roasted vegetable pilaf with chickpeas is rich in warm flavors and some of the season's best roasted root vegetables - it makes for a great ethnically inspired meal. 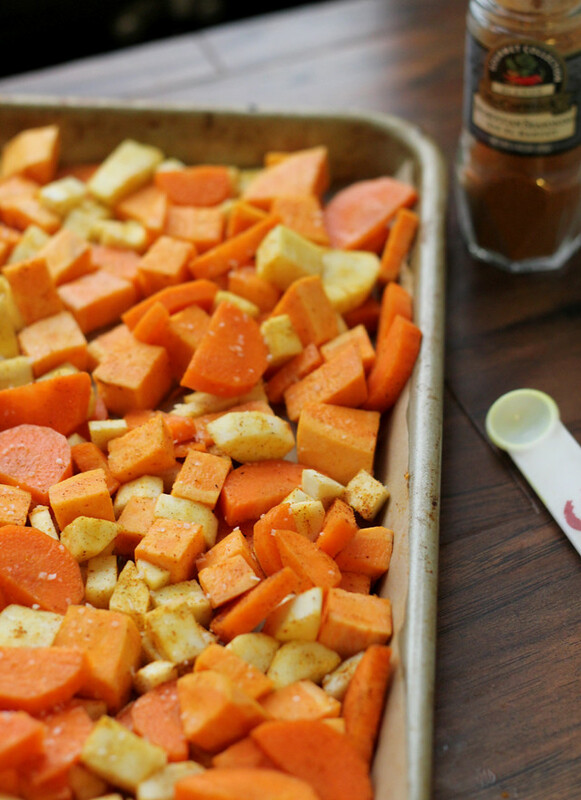 In a large bowl, combine the sweet potatoes, parsnips, olive oil, ras el hanout, and carrots. Mix in ½ tsp salt. Spread out on a parchment-lined baking sheet and bake for 30-40 minutes, or until vegetables are tender. Bring broth to a boil in a medium saucepan. Stir in the bulgur and ½ tsp salt. Lower the heat to a simmer, cover and cook for 15-20 minutes or until broth has evaporated and bulgur is cooked. Let stand covered for 5 minutes before fluffing. Stir in the chickpeas. For the topping, heat 1 tbsp olive oil in a medium skillet over medium heat. Add in the onion slices and cook for 12 minutes, stirring occasionally, until tender and golden brown. Add in the almonds and currants. Cook for two minutes. Stir in the cinnamon and cook for 30 seconds. Stir in the honey and remove from the heat. Distribute the bulgur among the serving dishes. Top with the roasted vegetables and then the onion topping. 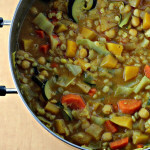 Moroccan-Spiced Root Vegetable Barley Stew…and a Review of Cookiepedia! The topping sounds so darn good. How is it that you always come up with the most original veggie laden recipes?? I’m in love with this. If I was strong enough to get out of bed today and actually felt like eating something, I’d totally make myself this for lunch. Hahaha Morocco inside when it’s cold outside….makes sense to me!! This recipe is totally fabulous. I need more bulgur in my life. Oh my goodness, YES! I’m pretty sure I could live off of this every day. Great combo of veggies and perfect use for bulgur! You’re so right – these kind of bright flavours are totally what you need to transport you far from home on a cold January day. Love this. I love “traveling” to warmer places during the thick of winter. Morocco sounds like the place to be today! Roasted veggies are always a win. And they’re so easy to make, even if you’re a little spent from the run. I like the concept of this Culinary Express. I’d love to get out of here and travel to somewhere warm, if not physically, at least through dishes like this one! Sounds delish! I always have an abundance of chick peas in the house – this is a great use for them. Seriously, Morocco sounds insanely better than “Chiberia”. Love this warming dish! I’m going to Morocco with you! Let’s take in the warmth, delicious food, and culture. I’m on a plane in t-minus 5 minutes. Annnnnd go! I hear ya! This weather is plain ridiculous. Right now the temps are zero and the wind is howling. I could use some of this incredible Moroccan veggie pilaf – in fact, I’ll take it all! Stay warm, Joanne, especially when you’re running!! I’m impressed you’ve been running outside in this cold! I’ve just given up, haha. I do love the sound of this dish – perfect for this horrible weather! Since it’s morning here, and I am starving, I really want a perfectly poached egg on top of this bowl full of goodness. YUM. I especially love the look of the topping on this. Where can I find ras el hanout?? This dish sounds like a MUST MAKE in my department! This sounds really good and perfect for the cold crazy weather we’ll having!! 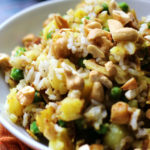 love the idea of culinary express..this pilaf looks so good. I will have to make this soon because I need a break from Dallas as well. My cousin ran 13.1 miles yesterday in NYC and I refuse to run when temps are 40 degrees outside here in Atlanta – I am such a cold wimp! But I do like spicy food – I have heard of “ras el hanout” but never used it – is it chili powder spicy? do you taste the cardamom and cloves? Love this dish Joanne – love the flavors and colors! This…actually makes me wonder whether my passport is expiring this year. 🙂 And I could definitely get behind a big plate of this pilaf–spicy roasted veg for the win! Ohhh I love ras el hanout. Keeping my fingers crossed things warm up to match your food soon! I love the idea of warming up in this unique way–looks hearty and delicious, Jo! I’m cranking up the thermostat, making this dish, and pretending I’m in Morocco! Yum! I’m amazed that you can do long runs in this weather! I’m such a wimp! 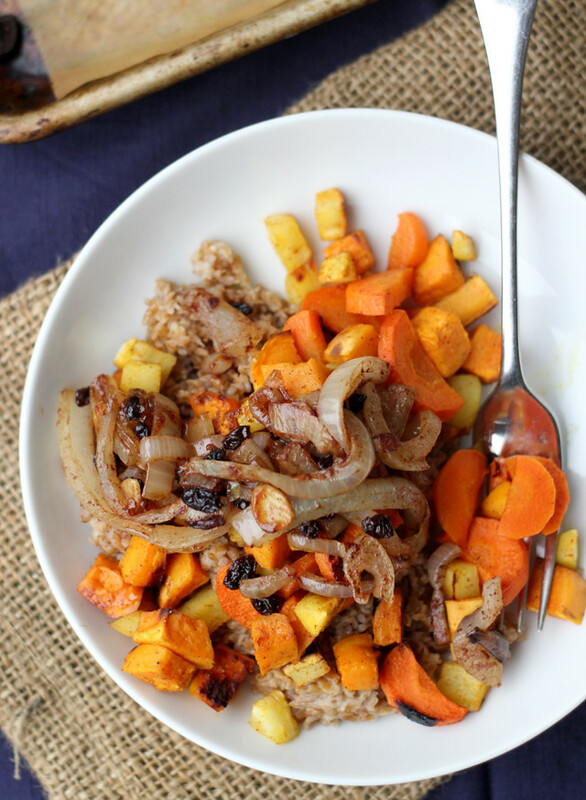 I’m loving that sweet caramelized onion topping with honey and almonds, and anything with sweet potatoes and moroccan spices is a win-win for me. 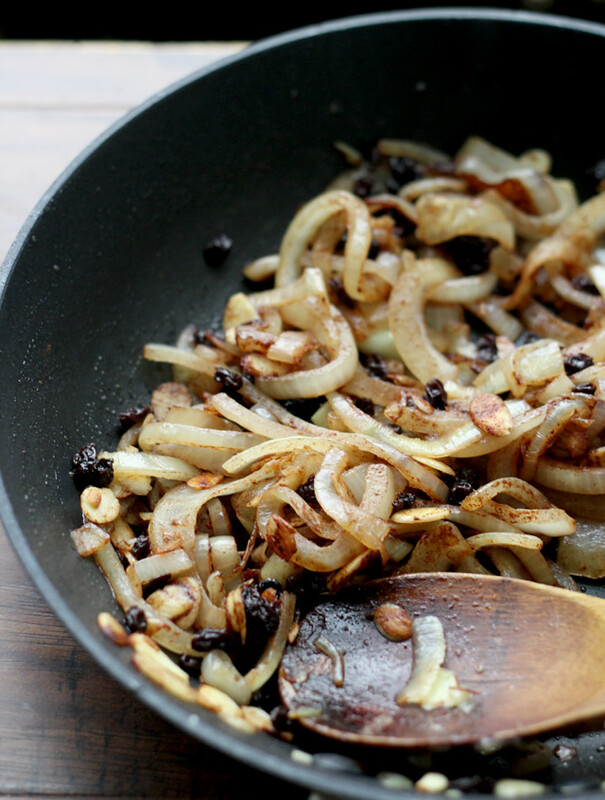 Love that roasted veggies and caramelized onions, during this time i would love to warm asian place aswell, but Morocco sounds wonderful…hats off that you run during this time of the year! I too could live off of this every day! 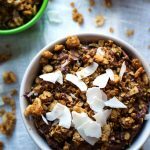 Love every single ingredient of this pilaf! One day we will actually travel to Morocco and it will be glorious. Until then! Your next goal: run more miles than the amount of degrees that it is outside. PS: I am going to e-mail you! 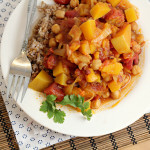 A perfect cold weather dish – wonderful ingredients and flavors and no need to go to Morocco! Oh yes… I make very similar dishes multiple times a week. Especially when I want something really satisfying that’s going to make me feel all warm and cozy. Gorgeous dish, Joanne! Just the thing to bring out of my cookie coma and warm me through and through! Those flavors together are pretty much rocking my world! I can’t imagine running in this weather. You rule. I love Middle Eastren meals! Middle eastern veggies? Yes, please! I’ll gladly take a culinary journey to Morocco. This dish sounds delicious. Morocco without leaving the house? Sounds brilliant to me! What a wonderful dish! I love when people aren’t afraid to add cinnamon to a savory dish. The taste is amazing…bookmarked! I’ve been to Marrakesh and its souks. I loved the food and the atmosphere! This is a beautiful dish my friend! I’m going to assume that you used bulgar in stead of rice as a pilaf just for me;-) I love moroccan flavors and rarely cook with them, need to try this! If I can’t actually enjoy warm weather, the next best thing is to have food that reminds me of warm weather. This looks so delicious! The spices are wonderful! Since I just returned from Marrakech, I am all about the Moroccan flavours right now. This looks delicious. The topping sounds like it is a great addition. This is such a great dinner! Love the bright flavors and anything that transports me from here. I keep saying this weather is unacceptable and I want to move as though that’s going to change something at this very moment. But I’ll be damned if I’m here next winter. I can feel the sun on my face just LOOKING at this gorgeous plate! 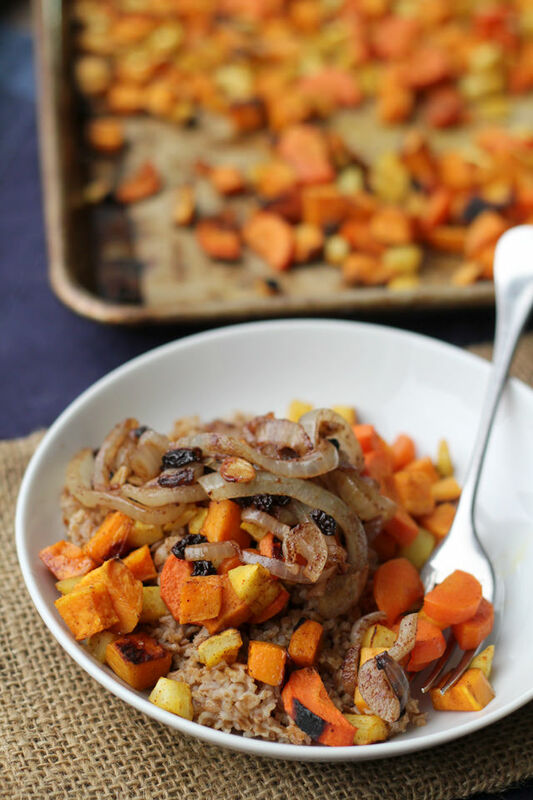 Stunning pilaf and that roasted vegetables look delicious….you’re making me want to travel to Morocco now! Made the pilaf for dinner tonight and it was absolutely fantastic! Thank you for this amazing recipe!